A day of Rainier hiking Eagle Peak hands you a bunch of opportunities. 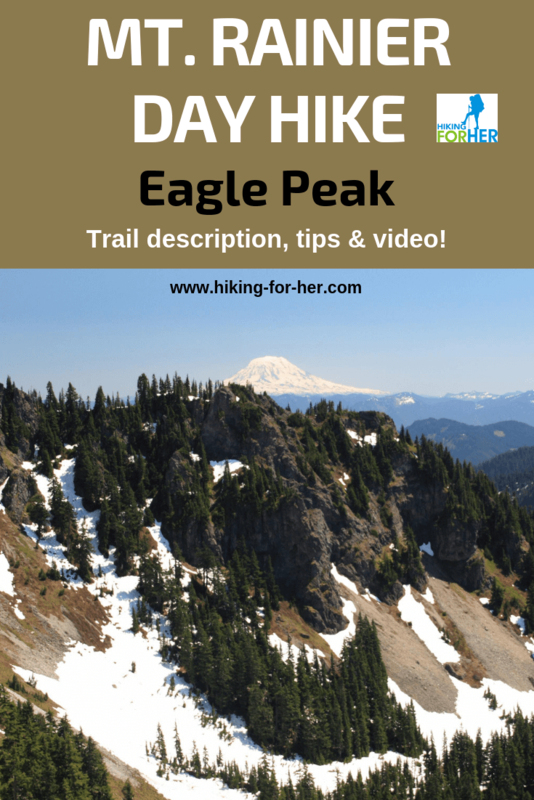 This trail description, photos and video of Eagle Peak hiking gives you all the details! Use the Nisqually Entrance to Mount Rainier National Park to drive to historical Longmire. You'll see the impressive building of the historic National Park Inn first, with a gorgeous view of Mount Rainier on your left. The park administration building comes up next on your right. Turn right when you see this building. If you miss it, you'll be heading up the long drive to Paradise. It's impressive, but not where your trailhead is located. Park in the Longmire paved parking lot. There is no designated area for day hikers or inn guests, so the lot can be very busy in the summer. You'll see employee housing and government vehicles parked on the road that parallels the headquarters, so walk that way toward the Nisqually River. Cross a sturdy suspension bridge over the river. Walk about 300 feet along the paved road until you spot the Eagle Peak trailhead sign on your left. This hike gives you an uphill workout! You're going to work a bit on this trail, with its relentless uphill tread. The footing is solid, and downright cushy as you pass through the towering trees. Around the three mile mark you'll notice things begin to open up around you, giving way to alpine meadows. The footing will also turn rocky, but the trail remains good. Depending upon the month, and even the week of the month, you'll see wildflowers and alpine plants galore - or their remnants. Keep hiking steeply upward until you hit the pass, and be sure to take advantage of a clear day to appreciate Mount Adams and Mount St. Helens, in addition to your close up view of Mount Rainier (see video). You can see Pinnacle Peak and Plummer Peak, at the opposite end of the Tatoosh Range, as well as the saddle between them, from your vantage point on Eagle Peak. Pinnacle Peak and Plummer Peak make a fine day hike destination! You'll start at Reflection Lakes up at Paradise. From your lofty vantage point you can also scope out the Van Trump day hike route, including thundering Comet Falls. Here's a link for you to see what that day hike is like. This trail might lull you into thinking it's a just an uphill snooze through the forest. But the last half mile up to the saddle will definitely get your attention. If you're uncomfortable with steep, rocky footing, you'll want to go slowly and use your trekking poles for balance and stability for the last half mile. The trail brings you to a Mount Rainier viewpoint, and if you're extremely lucky or have timed your hike for early or late in the day, you'll have the sturdy bench at the saddle all to yourself. A few more steps to the right may give you solitude and the chance to enjoy what you earned on a busy day. If you're a rock scrambler, you can reach the summit of Eagle Peak but it's considered Class IV so gauge your skills. Staying at the saddle gives you some serious gawking time, without risk. When taking selfies, remain alert to how close you are to the sheer drop off. Sometimes snow lingers on this trail, and can make route finding difficult in late June into July. You don't want to do the steep upper part on ice or compacted snow, so check with the rangers before you head up. It's not hard to understand why the Native word for this airy peak, Sim-layshe, honored the eagle. You may catch a glimpse of a raptor soaring on the thermals on this hike! The suspension bridge was built in 1923 so cars could reach a campground on the Nisqually River's south side. It's closed now, and has been since 1989. The bridge was re-built to its current glory in the early 1950s. If you're an engineer, you're going to appreciate the materials and design! Cars are infrequent but not unheard of, so remain vigilant with small children. On a warm day, linger in the middle of the bridge to appreciate the power and pristine waters of the mighty Nisqually River. If you haven't had a chance to hike through the quiet splendor of old growth forest, the Eagle Peak trail will fill your senses with what the world was like hundreds of years ago, when this peak was first named. The deeply forested, easy going trail pulls you onward and upward for a last half mile of gorgeous meadows. Before you know it, you'll be at the 5,700 foot saddle on Eagle Peak, gazing across at Mount Rainier. You can learn some lesser known Rainier landmarks from the Eagle Peak saddle, like Wilson Divide. Because this hike leaves from the relative luxury of the enclave known as Longmire, you can buy a snack, use the public restrooms, and top off your water bottle before you head over to the trailhead. NOTE: There is a stream at around the 2.5 mile mark on this hike, but you'll need to treat the water. If you need to fuel up before the long drive home, why not enjoy dinner at the Inn? The menu is posted in the lobby, and you never know what the specials will be. You can rest your feet on the porch afterwards! 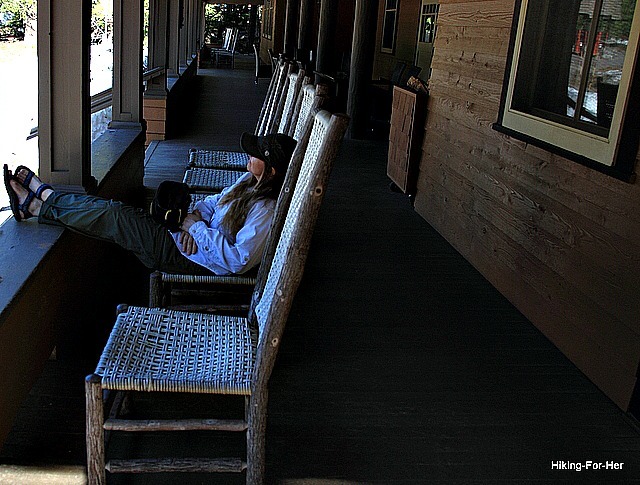 And if you can't bear to leave Mount Rainier, stay overnight at the rustic inn. It's quieter, as in less hectic, than the Paradise Inn. And you can hang out by the Nisqually River the next morning before you head home! Not sure if this trail is for you? Contact me and ask your questions.